Want to wake up on two of Australia’s most renowned dive sites? Then read on! Both reef lovers and wreck explorers will be kept in awe whilst staying aboard MV Sea-Esta for the only Liveaboard trip to depart from Townsville. Staying on the most pristine reefs within the Great Barrier Reef Marine Park. Dive or Snorkel all day and into the night to experience the unlimited visibility of Wheeler Reef and the myriad of gullies and canyons at Keeper and Davies Reef. 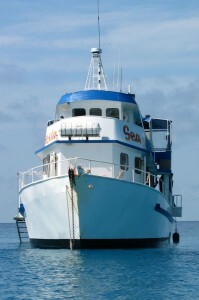 Up to 8 dives including 2 night dives can be enjoyed over the first 2 days on the Great Barrier Reef. Don’t drop your regulator during two jaw-dropping early morning dives on the SS Yongala Wreck! Huge groupers, giant rays, turtles, sea snakes, sharks and massive schools of fish use the ship as their home. Sometimes, even Humpback Whales pass by to say hello! This is the dive site for big, exciting pelagic creatures, but also macro critters living on the encrusting coral. Diving the Yongala is simply spectacular every dive, all year round. Some of the features the vessel are Accommodation for 20 passengers in budget style, air conditioned double, twin & quad-share cabins. A large fully equipped dive deck as well as a BBQ / entertainment deck upstairs. Your trip includes 10 dives including 2 night dives as well as 2 dives on the Yongala shipwreck, rated one of the World’s Top 10 Wreck Dives. All meals are supplied on board and our crew ensures no-one goes hungry, special diets are also catered for. Our Scheduled Departure Dates for 2018 can be found here.